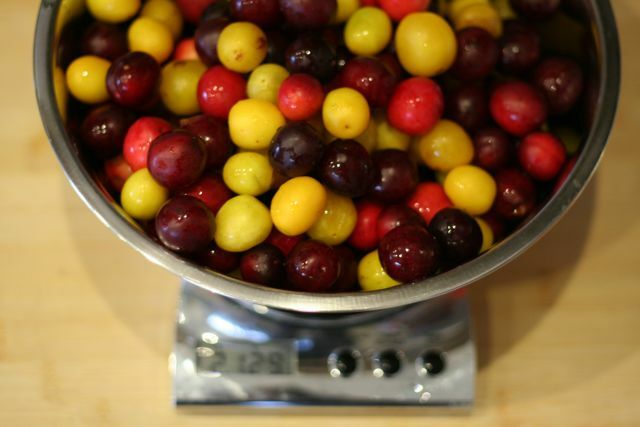 When the Bullis (a type of small plum) were ripe I foraged as much as I could, washed, halved and stoned them and put them in the freezer so I could make jam at a later date. 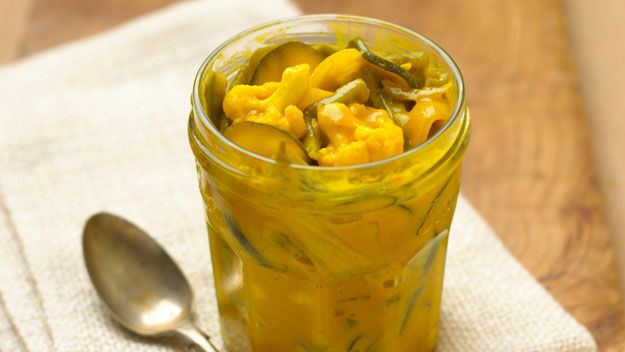 I decided to make piccalilli to use up some courgettes, marrow and green tomatoes that have been kicking around. There are many ways of sterilizing your clean glass jars for preserving. The way I do it, is to put my dish washer onto a Hot cleaning programme. They come out of the dish washer dry, and I fill them while both jam and jars are still hot. Wear an apron, boiling jam can spit and burn you! Set of weighing scales, Large Sauce pan, wooden spoon, 1 large metal tbsp, Sterilised glass jars, wax discs to seal the jam, Lids or cellophane disc & rubber band with decorative disc(optional),Spatula, Funnel and Ladel, Jam labels or white sticky labels and either a permanent marker or a biro (I don’t recommend a gel pen as they smudge). 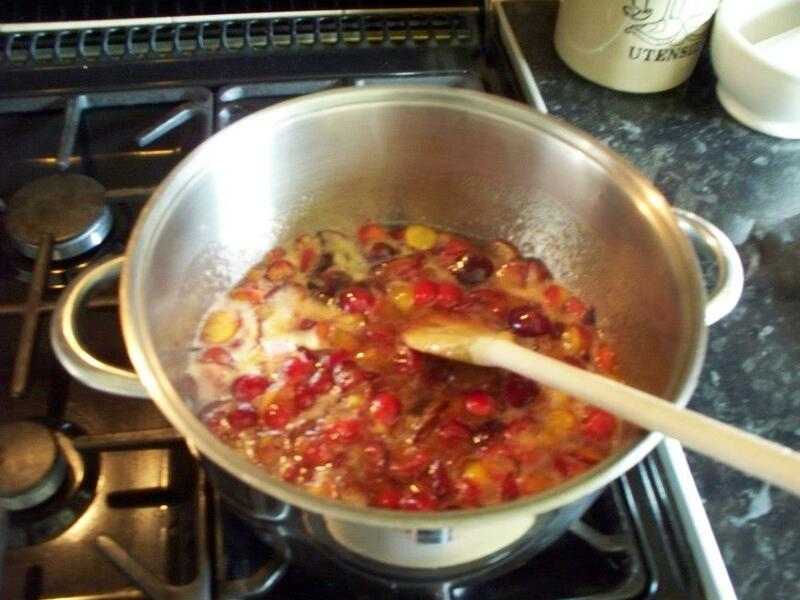 1) Add plums and sugar to a large pan on a low heat, simmer for 30 mins. 2) Then bring to a rapid boil for 15 mins. stir the mixture regularly with your wooden spoon. Holding your wooden spoon upright touching the bottom of the pan,you drag your wooden spoon through the jam in a straight line if there’s a moment when you can see the bottom of the pan before the jam closes the gap again that’s a pretty good indication it’s thick enough and set. The other tip to try is using a chilled plate spoon a little of your mixture onto it, leave for 5 mins then using your finger draw a line in it, if a skin forms this is another good indication it has set! 5) Stir the butter into the jam (this will dissipate any remaining scum). 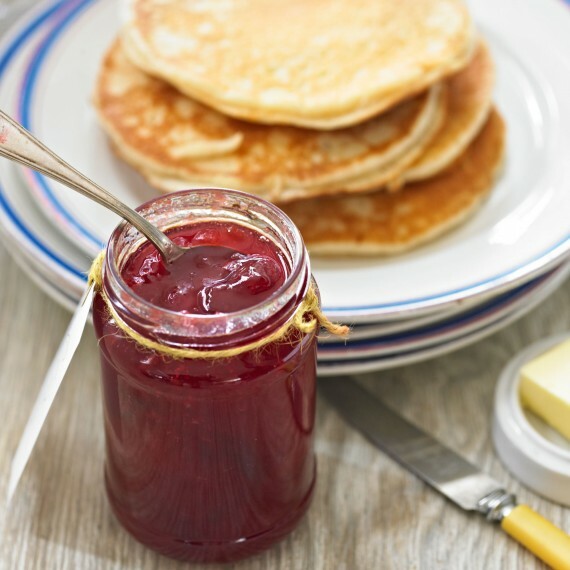 6) Allow the jam to cool a little then using ladel pour into the warm sterilised glass jars using the funnel. Use spatula to get any remaining jam out. Then top with a wax disk/ grease proof paper disc while still warm. Once cool top with lids or cellophane disc, rubber band and pretty paper or material disc. 7) Don’t forget to label your jars with the name, date and if you like something personal like where you foraged the fruit. Wear an apron, boiling preserves can spit and burn you! Set of weighing scales, colander, Large Sauce pan, wooden spoon, 1 large metal tbsp, Sterilised glass jars, wax discs to seal the jam, Lids or cellophane disc & rubber band with decorative disc(optional),Spatula, Funnel and Ladel, Jam labels or white sticky labels and either a permanent marker or a biro (I don’t recommend a gel pen as they smudge). 1) Take small chopped veggie pieces and layer in a sauce pan, veggies layer table salt veggie layer table salt and so on, until all your veggies ar in the pan. 2) Top up with cold tap water and leave over night. 4) Mix sugar, Mustard and ginger (BUT NOT TUMERIC OR CORNFLOUR) with 450 ml of vinegar in a large saucepan, bring to the boil. 5) Add veggies, return to the boil; cover and simmer gently until tender-crisp (NOT cooked through NOT mushy) for about 10 mins. 6) Blend cornflour and turmeric with remaining vinegar, add to the pan, return to the boil for about 2 mins. 7) Using Ladel Pack veggies into sterilised jars, with the funnel in it,use spatula to get any remaining sauce, Seal and label. Leave at least 2 wks before opening for flavours to mature.